Student Studio is a service that aims to radically increase the quality and volume of work experience in the construction and engineering sectors. Companies using Student Studio have access to a suite of online engineering-related projects that students can work through during placements. These projects, designed to be carried out in a workplace setting, are intended to simulate what it is like to work on a real project, with realistic tasks to be completed and daily milestones to be met. Bringing everything together is the Student Studio website, a virtual learning environment (VLE) created by Think Up in which students access briefing and supporting information for their projects, interact with students working on other projects in other companies, and record what they are learning in their reflective blog. At Think Up, we see virtual learning environments as valuable complement to, rather than an replacement of, real learning environments. 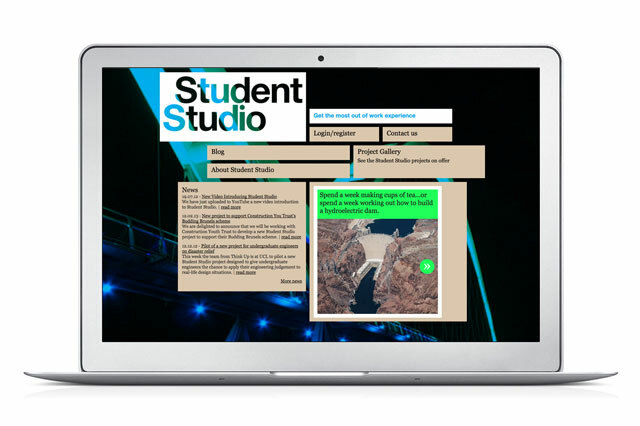 By combining rich digital resources, accessible through the Student Studio website, with hands-on face-to-face activities with colleagues from the host company, Student Studio creates a highly engaging blended learning. The Student Studio website is currently undergoing a major rebuild and the new version will be ready for beta testing in Spring 2015.